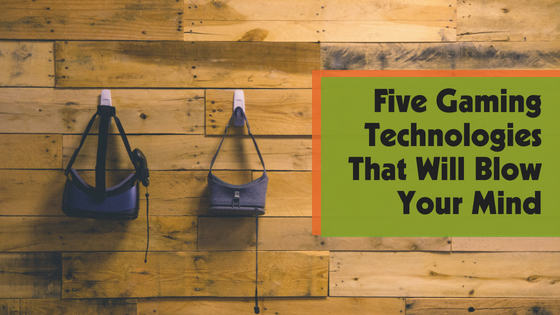 Advancements in technology are becoming more prevalent and cooler than ever before. Gaming is one industry that enjoys the most extreme technological advances for the simple purpose of having fun. Let’s explore some upcoming gaming technology that is sure to leave you craving the next mainstream gaming innovation. Suit up and feel fully immersed in your game while this suit pushes and pulls on your body. Feel the simulated force of an explosion or the pulse that hits your body like a paintball exploding on your chest. Gaming suits put playing into real scenarios that provide instant feedback to what is going on in your game. Just like Apple’s rollout of Animojis, facial recognition is hitting the gaming space to provide even more detailed characters. 3D scanning technologies allow gamers to put themselves into their gaming world. By making a virtual version of yourself, players can interact with each other just like they would in reality. Using 3D cameras, gamers will have the power to control their console without needing a physical controller. Tracking over 20 points on your hand, Intel’s RealSense can spot where your hand is and what motion it’s making. Losing the controllers, gamers are invited to a more interactive version of their favorite game. More advanced games mean more intense gaming hardware. However, with cloud computing, gamers will soon experience complex games without the need for bulky hardware. Using the cloud, developers can invite gamers to new leaps in technology that bring complex open worlds that require massive server space using the internet. Are you ready for the future? Because the Microsoft HoloLens certainly is. Covering a gamer’s entire vision, the HaloLens eliminates the need for a heavy flat screen shining in front of your face. With the ability to follow your vision at the turn of your neck, the HaloLens simulates a fully immersed gaming field. Can’t wait for these gaming technologies to hit the mainstream market? Neither can we! The gaming enthusiasts at Game Truck San Jose is ready to supply your next party with hassle-free gaming featuring multiple gaming consoles and popular games. And the best part: no mess to clean up when the party’s over.